With Easter just a day or so away, I thought this weeks recipe should be Easter appropriate. However, we make this often at our house. 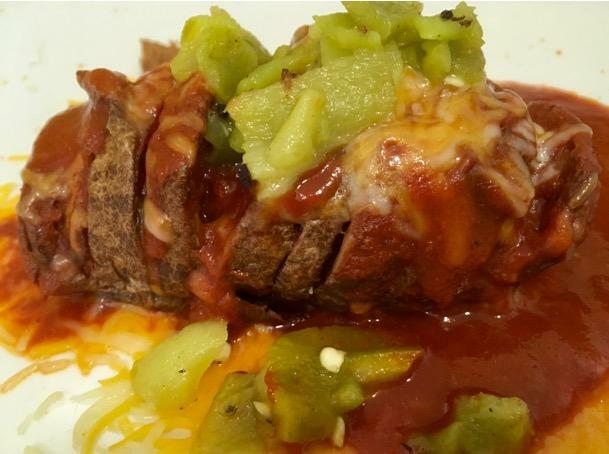 -Add ins are fun - bacon, green chile, ham, veggies, jalapenos. -Great any time of day. -Great with an egg on top. 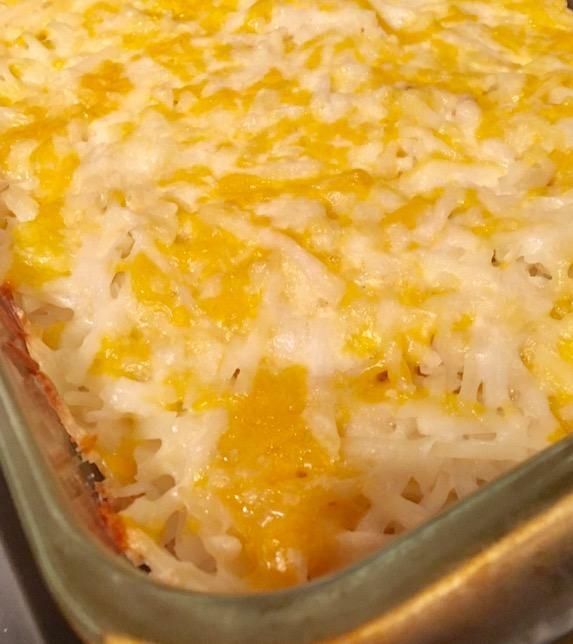 2 Cup Shredded Cheese, I use a Cheddar Jack Mix (you could use a pepper jack as well). Sprinkle of Salt and Pepper (I don't count these as ingredients, because I assume you have these at your house). Spray a 9 x 13 pan with spray release. Layer 1/2 of the potatoes on bottom, add 1/2 of the cheese, and 1/2 of any add ins if you want. 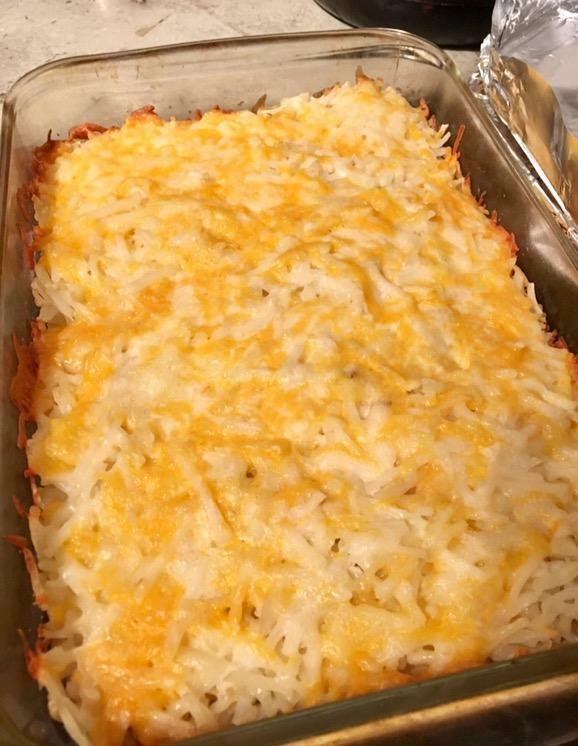 Top with remaining potatoes, and any ad ins, then pour cream over top, cover with the rest of the cheese, and bake covered for 45 minutes. Then remove cover and bake for 15 minutes until golden. Back in the old days --- haha, if you wanted a recipe, it came out of a cookbook, or from a friend, neighbor, parent, grandparent, magazine, newspaper. Many times you would be at someone's house have a great meal and ask for the recipe. Most of the time it would be handwritten. We want to bring that back. 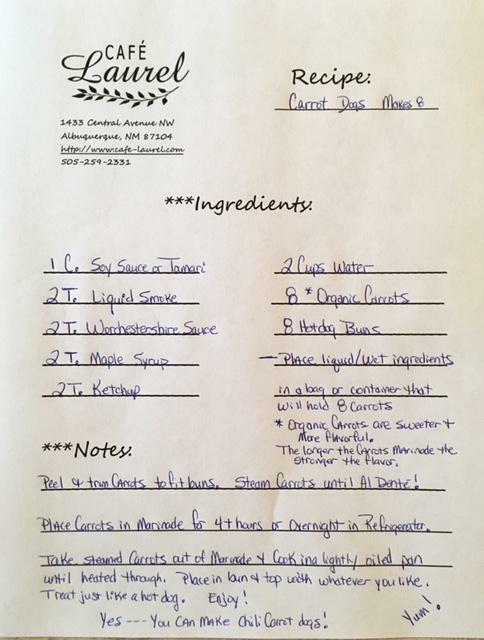 Each Saturday we are going to bring you a new fun recipe, handwritten on our Recipe Cards. You can pick up at the Cafe, or you can print this one out for yourself. 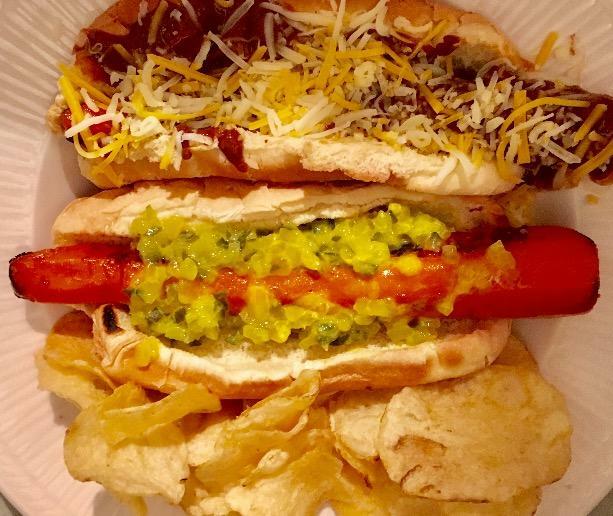 This week we bring you Carrot Dogs. Easter Bunny Approved. I have an obsession with bbq. I love all of it. In my quest to be healthier, I have tried to do a veggie bbq. 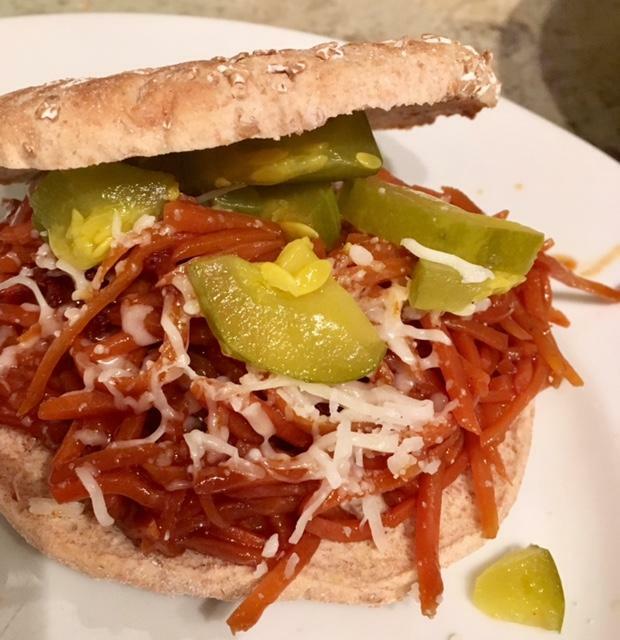 Thus -- the pulled carrot bbq sandwich. Now - I am a cheater when I cook at home, and used shredded bagged carrots. cooked them all day. They were tender, juicy, and very tangy. Topped with bread and butter pickle chunks, and a hint of cheese. I even used a low cal/carb sandwich roll. Your Meatless Monday is calling, and it is quick and easy, and includes bbq. What can I say? I love potatoes.!! Now mind you, when I get home from the Cafe, I don't have time for a full cook of a baked potato. So -- i give a good wash, and prick with a fork, then microwave 6-7 minutes, until tenderish, a little al dente. 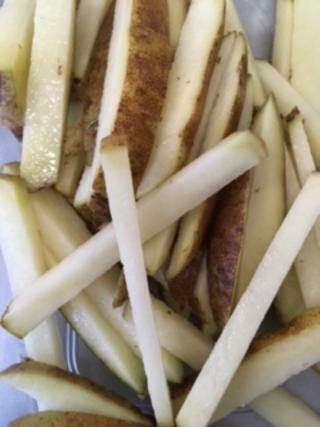 Then, put 2 dinner knives on each side of potato and cut down to knives, peel back, add extra butter, and bake at 350 degrees for 15 - 20 minutes ( I wish I had cut mine thinner ). Then, cheese, green chile, red chile, load it up, bacon, chives, and put back in oven to melt. Making for Kids -- or adults that don't like chile. -- just bake with butter, then add sugar and salt, (kind of like the Buffalo Wild Wings Fries). You can do this, you are the cook!! Make it an experiment night. Try different kinds, see what you like, get the family involved. Cooking is fun. Truth, it doesn't always come out as expected. But, the shared experience is what makes it great. We know you are looking for some springtime recipes. We also know you are looking for some Easter recipes. Wow, goes great on biscuits, toast, cornbread, you name it. 1/2 Cup (I stick unsalted butter). Mix or beat in with blender, the powdered sugar, until smooth. (If you have a sweet tooth, you can add a tablespoon more). 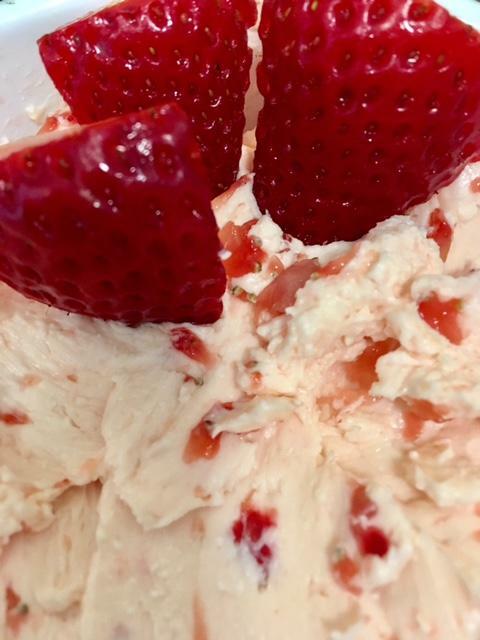 Chop strawberries really fine, and mix into butter mixture. Then let sit for 10 minutes and the strawberries will start to weep. Now mix thoroughly and put in bowl in the refrigerator. Ready to serve. Will keep in cold for 7-10 days. Or -- roll in a log, in plastic wrap and freeze. **It won't last that long. This is a make it your own recipe. Try it on a cracker or piece of toast and tweak it to your taste. You are the cook!! You've got this!! FRY THIS!!! BAKED FRIES RECIPE! Ok, so we have a fryer in the Cafe. No -- we have never used it. I am obsessed with Fries!! But I also, want some healthy options. Like you, we do cook at home. 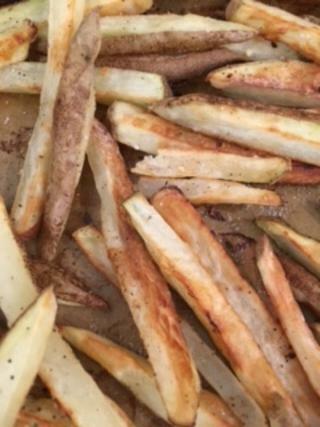 In Coming --- Baked Fries that are Ridiculously Easy and Good!! Ok, so this started while back when I took our Daughter to get a quick headshot for some applications. After, she ran by and got some Wing Stop Fries. I said, hey, I can do that -- better and healthier. Regular old Russet Potatoes. At least 1 per person. In my world 2 - serious fry-o-haulics here!! -Then cut into fries. I like a thickish, but you can quickly hand slice them as thick as you want. -Soak in cold water for a minimum of 20 minutes to remove starch. -Drain well. (I used a collander over a bowl). -Put on oil sprayed cookie sheet. -Spread out in single layer on cookie sheet. -Bake at 450 for about 40-45 minutes. Turn a couple of times. -Mix some salt, pepper, garlic powder (just a pinch) and sugar!! (I eyeballed it). -Sprinkle on fries. Mix around on cookie sheet, to coat. (I wish I had of used more sugar). Use your judgement here. -Want more to stick. Give a light oil spray, mix with sugar mixture and put back in oven for a few mintes (5 or less). We dipped in: Ketchup, Honey Mustard, Srirracha Mayo , BBQ Sauce, and of course Ranch. Make this your own. Experiment. Get the kids, hubs, everyone involved. Taste, add more seasoning. Enjoy, Celebrate, and think of us!! Such a super easy and yummy recipe. Perfect to make ahead and have ready when you need it. Add the cream to a pitcher, then whisk in the vanilla and egg. Pour the cream mixture into the flour mixture; stir gently with a fork just until it comes together. You can also make round scones, use any 2" round cutter - Lid, Glass, or hand form. For the glaze: Add the milk and vanilla to a pitcher and mix together. Mix the confectioners' sugar and salt in a bowl. Add the milk mixture and stir or whisk until completely smooth. Add more confectioners' sugar or milk if necessary to get the consistency the right thickness. I like my drizzle pretty thick, so I use a bowl, or glass and put my sugar in it, then very lightly add a bit of water/milk and stir to get the thickness I want. One at a time, carefully dunk each cooled scone in the glaze, turning it over if necessary to completely coat. Put on a cooling rack over a baking sheet. Allow the glaze to set completely, about 1 hour. The scones will keep several days if glazed. (Put in refrigerator to speed setting.) 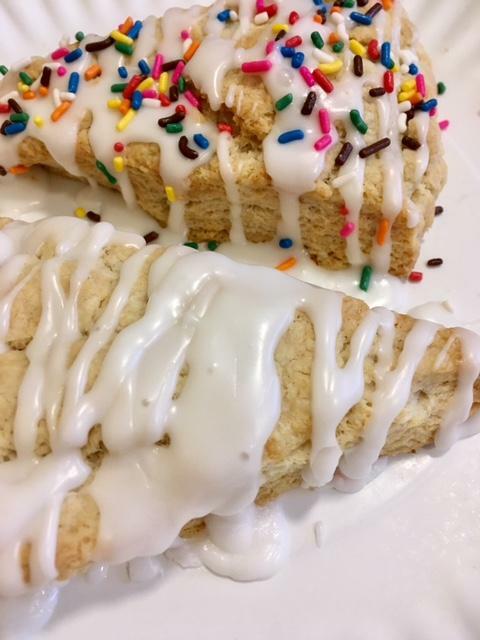 I am a drizzler, and prefer to drizzle my scones. Scones can be frozen either, baked or unbaked. When ready just pop in oven to cook, or set out in refrigerator to defrost and eat. Avocado Toast. Just add egg!! We love Avocado Toast here at the Cafe. We love all Toast!! 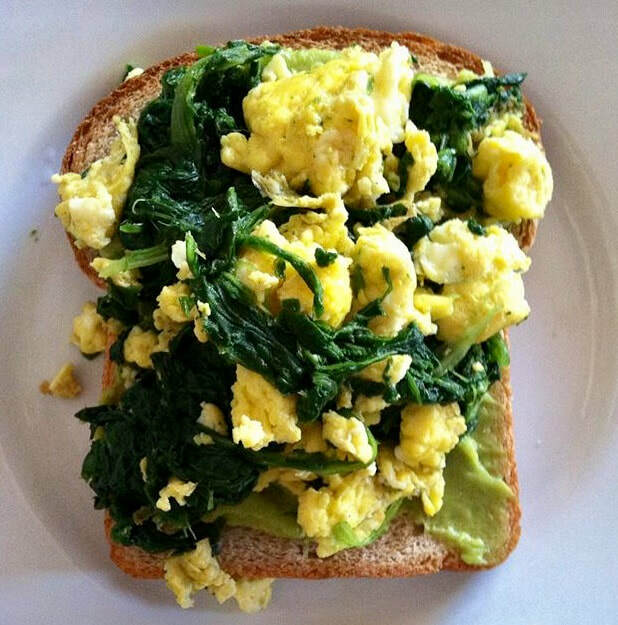 Simple fun and easy, we like to smash our avocados and add all the goodies. Smash and mix all together. 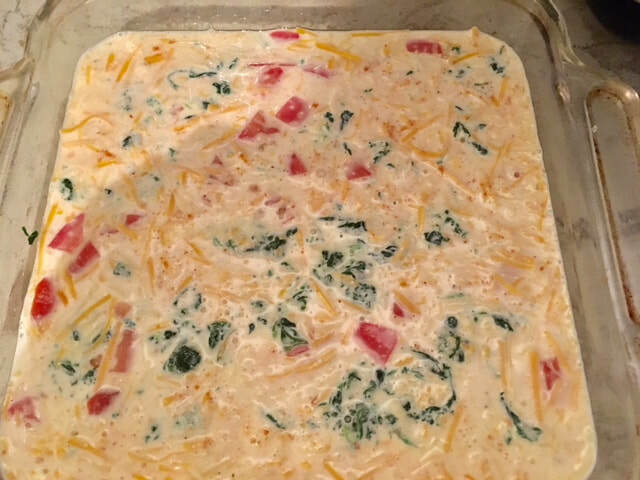 Add Spinach and Egg or Tomatoes if wanted. Don't limit to avocados. Humus is wonderful as well. We admit it. We love quiche. 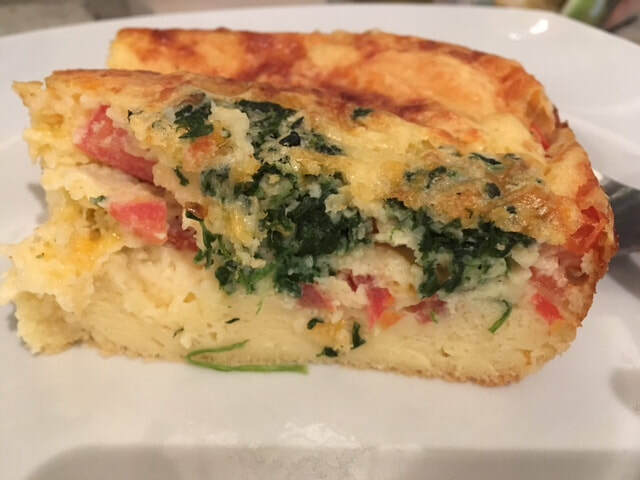 Our quiche at Cafe Laurel is a customer favorite. We love the buttery crust and the fresh ingredients. What else do we admit? We admit to buying too many veggies when we shop, or when we are at the outdoor markets. What? You too. Yep, everyone. 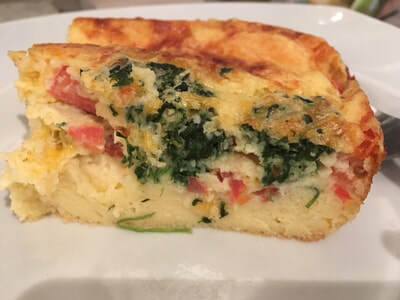 Well below is the recipe for Bisquick's Impossible Quiche. No need to make a crust, the Bisquick settles at the bottom and makes a crust like bottom. 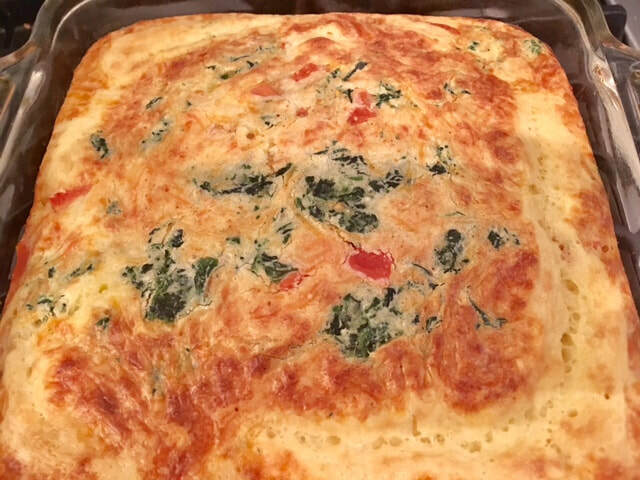 Also, it is great for leftover veggies, meats, cheese, and is great for breakfast, lunch or dinner. Now you have found a use for all those Grower's Market Veggies!! 9x9 Pyrex square pan. Or any 9" pan of choice. 1 Cup of veggies or meat of choice. Grease bottom and sides of your pan. Put veggies and any meat on bottom of pan. 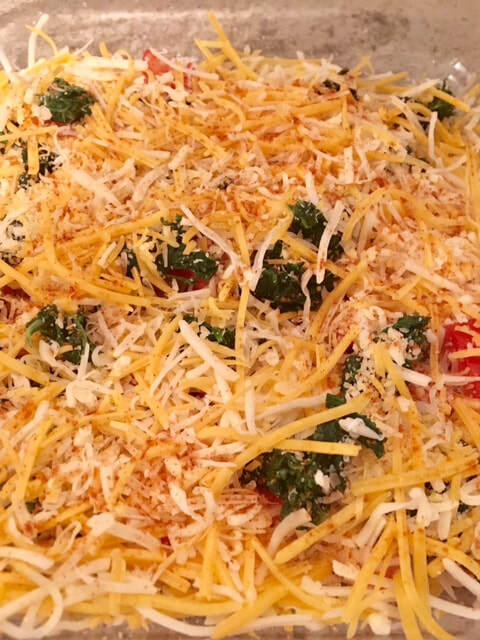 Sprinkle cheese on top of veggies - on bottom of pan. Mix Milk, Bisquick, Eggs, Salt, Pepper in a separate bowl. Mix well, use a mixer if necessary, get all the lumps out, (that is important), works so much better without the lumps. Now, gently pour on top of veggies and cheese, (they will float towards the top). Put in preheated 400 degree oven for 35-45 minutes, until done and set. Then let it rest for 15 minutes on counter before you cut into it. (We admit we love it more the next day)! ​Veggies on bottom. Egg Mixture Added. Baked. Yum. Just fun recipes we make for ourselves, friends and family.